Is SolarCity a Good Deal? What is a Solar Power Purchase Agreement (PPA)? You could save over 70% on your electric bill. Opportunities for Solar Power at Home in Arizona: Save Money and Help The Environment! As it turns out, there’s one simple reason why the cost of solar has been plummeting. 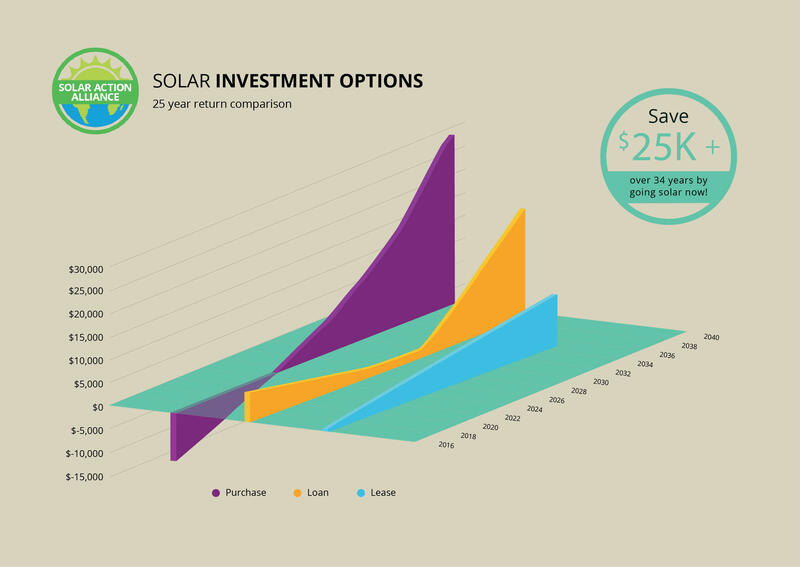 This page goes over this effect as well your options for saving money with solar…and more! As hot and dry as it is in Arizona, it will come as no surprise that the state has one of the highest solar generation capacities in the country. And lately, the state has taken steps to make full use of that free energy. Click here if you’d like a free quote from a trusted local installer. As the following graph of the Swanson Effect shows, the cost of solar has dropped dramatically. It is now incredibly affordable and cost-effective to install and use solar panels in Arizona. Due to some positive changes in the Arizona Renewables Portfolio Standards (RPS), solar use has tripled in the state in the last few years. And it looks like that positive momentum will continue in the near future. Some areas of the state (e.g., Phoenix and Tuscon) are even offering to install solar panels on your roof for free—if you cannot afford to buy to them. While this is not as profitable or cost-effective as buying, it gives more homes in the state the opportunity to benefit from clean, efficient solar energy. Let’s take a look at some of the great solar options available in Arizona. Comparing Your Arizona Solar Panel Options…Easily! The chart below gives you an idea of the costs and returns for each solar option available to Arizona residents—cash purchase, purchase with credit, and solar leasing. If you remember one thing from the chart below, it should be that using solar power in Arizona makes you money. Unlike states with weaker solar programs and lower energy costs, Arizona actually makes you money right away. A cash purchase always delivers the largest, most immediate savings. With no loan payments, you realize 100% of the energy savings immediately, along with the 30% federal tax credit. Considering an average purchase price of $17,500 for a 5kW system, you will receive a federal tax credit of $5,250 (30% on the net cost). That means your first-year investment is only around $12,250! Your energy savings the first year should be around $1,040. Taking into account the inflation of energy costs, your system should pay for itself in around 10 years. And by year 25, you should see a net profit of around $30,000! Not a bad return. And remember that you are helping to provide well-paying local jobs and to save the environment. *Popular Option* Purchase Your Panel with Credit: No Cash Needed! 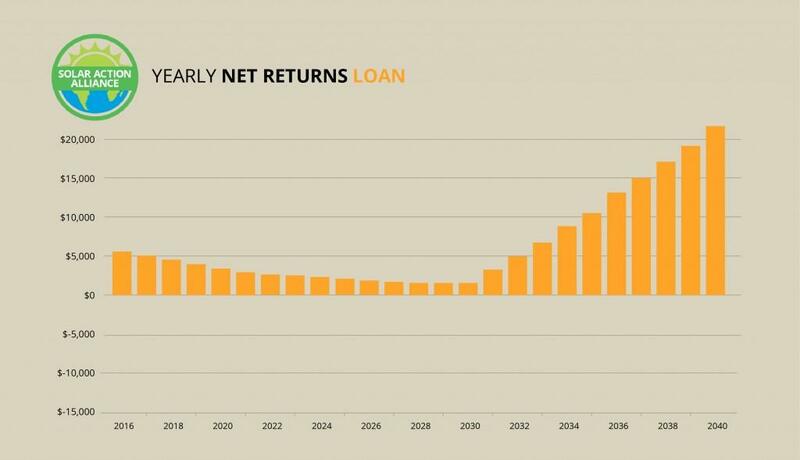 For most people, paying for solar with a home equity loan makes the most sense. Because you are using a home equity loan, you not only get the 30% federal credit, but you can also deduct the interest on the loan. You get all of the benefits and incentives without any cash out-of-pocket. Let’s assume that you have a home equity loan of 5% for a $17,500 system. While there will be a few years at the beginning when the loan payments are greater than the savings of energy costs, energy inflation will quickly outpace your loan payment. With an average installation price of $17,500, a purchase on credit makes perfect financial sense. During year one, you should have about $1,039 in energy costs, and your loan payments should total about $1,661. This means that you pay around $52 per month out-of-pocket your first year. But remember, you’re getting $5,250 in tax credits. That tax credit means you are $4,628 ahead the first year! By year 15, when the loan is paid off, you will be realizing about $1,300 per year in savings. And by year 25, your total net returns are around $21,800—even after paying off your system! If you would like a custom quote based on your energy use, click here. What’s the real story here? Leasing is a great way to go solar if you are short on cash, or if you don’t have the ability to take out a loan. 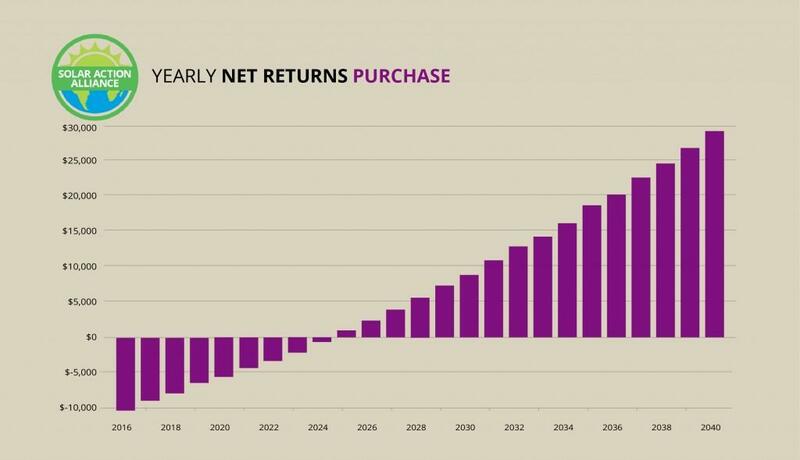 As you can see in the chart below, the immediate returns are not as impressive. But due to the relatively high energy costs in Arizona and the standard inflation of energy costs, your savings multiply year after year! In Arizona, you will start out with the relatively small savings of $28 per month. But this multiplies over time, and all of this money will go directly into your savings with no out-of-pocket. With standard leasing, you basically pay a rental payment for a solar roof system. The system is installed on your roof and maintained by the solar company. Depending on the amount of sun you get, the lease payment plus the new, lower electric bill should be less than what you are currently paying. With a Power Purchase Agreement (PPA), you agree to allow a company to install the system on your roof. Then you purchase the energy your panels produce at a substantial discount of your current residential electric rates. As with a lease, the company maintains the system and assumes all risk. You just collect the savings. Keep in mind that with a lease, you do not get the residual value of the system, as you do not own it. You also do not receive any of the tax credits or other benefits of home solar ownership, other than lower energy costs. Arizona’s Renewable Portfolio Standard (RPS) Guidelines: Government Incentives To Help You Save Even More! A state’s Renewable Portfolio Standard (RPS) is a plan based on legislation or regulations. It outlines goals and targets for the production of renewable energy in that state. The RPS is the tool that encourages power companies to supply renewable energy, rather than using fossil fuels. Though there are some states with stronger RPS guidelines, Arizona is pretty strong. It has a mandate that by 2025, almost 15% of electricity must be generated by renewables. This means that you can most likely use your state to help you save even more on solar panels. This includes tax incentives, rebates, and even selling your extra energy back to the grid…sometimes for a profit! Arizona has some of the nation’s lowest energy costs. Higher energy costs naturally drive the use of alternative energies, such as solar. A rise in energy costs equal a rise in renewable energies. The state has not sufficiently regulated interconnection policies for home solar. Interconnection rules govern how home systems hook up to the power grid. A lack of these rules greatly increases the costs utilities—both plugging them in and sending the power back. Solar rebates are now effectively zero in Arizona, as the local utilities have come closer to meeting their RPS guidelines. A new rebate program would greatly increase participation in renewables generation. Solar performance payments (i.e., rewards for production of solar power) are nonexistent in Arizona. Solar performance payments are bonuses paid to homeowners producing solar energy. 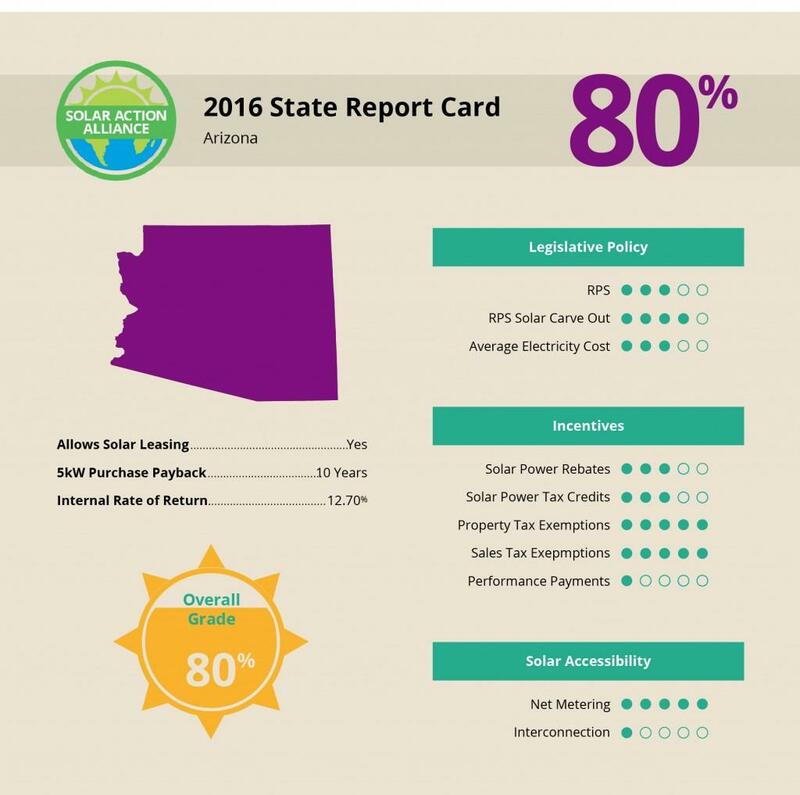 Some Positive Signs for Solar in Arizona…the Future of AZ Solar Is Bright! Arizona has the nation’s 6th largest solar carve-out. This means that a certain amount of energy in the state must be generated by renewables like solar. Net metering requires each utility to monitor how much energy is produced, and to credit you for any excess over what you use. Arizona has excellent net metering laws. It indefinitely credits each surplus to the next utility bill, or allows some customers to receive the surplus as an annual payment. In Arizona, solar purchases are exempt from both state sales tax and property taxes, effectively lowering the upfront costs of installing and keeping solar on your property. Though there is room for improvement in the areas of solar rebates, interconnectivity, and solar performance payments, Arizona has been a really consistent leader in encouraging and promoting renewable energy. 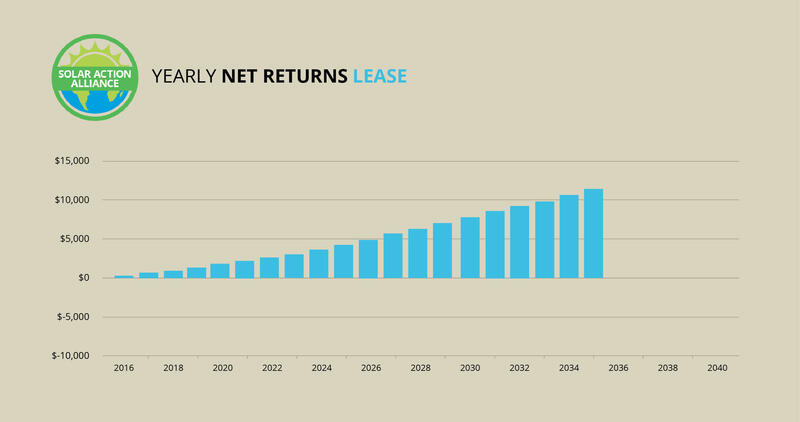 And this leadership shows in the generous returns that are available to consumers investing in solar. How can you actually use this information? What’s the next step? Join the 1000s we've helped switch to solar!